Our Dress of the Week blog series is back! In case you missed the intro to this new series, you can read all about it here. We hope to create and share info that makes our Mesa bridal boutique website your go to Arizona bridal blog. We know there's just a few wedding blogs out there for you to keep up with but we hope you'll make space for us in your RSS feed. 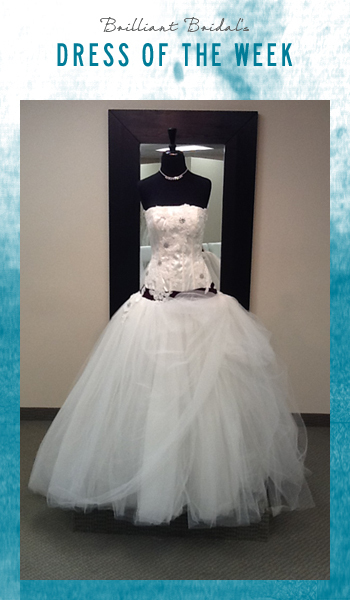 St. Pucchi bridal gown at our Mesa bridal boutique! This ivory size 0 drop waist ball gown wedding dress features a satin bodice with exposed corset and lace applique and a ivory tulle skirt with a plum sash. With the additional 10% off for our Dress of the Week feature, your price is $895 this week only! Walk-in's are always welcome at Brilliant Bridal (though expect a wait on the weekends) so come in at your convenience to try on this amazing wedding dress and save thousands on your designer bridal gown!